It’s likely that most of us have heard the phrase “poor planning = poor performance” or “fail to plan – plan to fail” and other variations on the same theme. What it all boils down to is that the success of any plan, process, initiative, project is usually determined by the quality of the planning process. This is particularly true and vitally important in terms of Projects. I’m sure you’ll agree that, amongst other aspects, the up-front planning stage of a project (or a series of related tasks e.g. arising out of a meeting) the “Why?” “What?” “Who” “When?” and “How?” of the initial planning stage, need be clearly identified, effectively captured, clearly understood and well communicated. 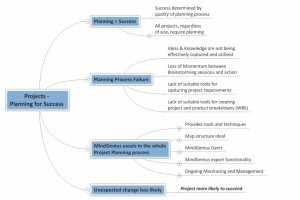 In recent times I have been very aware of the rise in business mind mapping software in the project management arena. More and more project managers/workers are beginning to see the huge benefits in terms of overall process efficiency and productivity in general that business mind mapping brings. There is no doubt that using business mind mapping software greatly increases the chances of project success – not only at the critical front-end, but through the whole project lifecycle. Author Bio: Jamie MacDonald, is Head of Client Development at MindGenius Ltd, developers of the leading business mind mapping software MindGenius. He is a highly experienced trainer, facilitator and coach with over 20 years’ experience in training, organisational development, HRM and performance improvement. Jamie specialises in the application of MindGenius business mind mapping software as a catalyst for enhanced personal, team and organisational performance and productivity. ‹ Learn to translate (what your team are saying) in 20 seconds! I think mind mapping is a very useful exercise in project planning and delivery. It concentrates the planning process and provides a user friendly overview of the various tasks that make up the deliverables. This can be used to engage stakeholders and enable buy-in in a quick and straight forward process.